You want the special effect makeup brands that make your exciting and terrifying makeup concepts a reality. That’s why we carry such an extensive range of special effects makeup products to serve our customers across an entertainment industry with such diverse demands. If you don’t see something you need, please contact one of our accredited makeup specialists to help you. FX Transfers apply with only water and stay on all night. Created by Hollywood FX artists to be the most realistic wound FX on the market. Vampire Bites that look real! Two puncture marks expertly colored by hand. Edges blend into your skin for an ultra realistic effect! 3D FX Transfers are the revolutionary prosthetic for your Halloween Costume or special event. No need for sticky glues anymore. These 3D transfers apply with water and are latex free. FX Transfers apply with only water and stay on all night. Created by Hollywood FX artists to be the most realistic Zombie FX on the market. Outbreak is perfect for any zombie look! Bubble line and festering skin that looks so real. No need for sticky glues anymore. 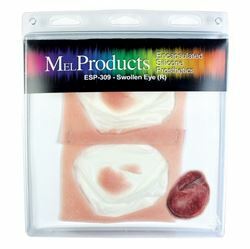 Engraved Special FX Make-Up Wound Transfers apply with only water and stay on all night. Created by Hollywood FX artists to be the most realistic wound FX on the market. 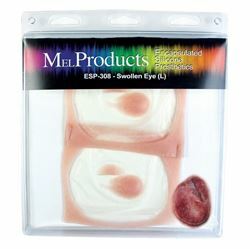 Encapsulated Silicone Prosthetics (ESP) Large Right Swollen Eye - 2.5 Inches. Each ESP comes with 2 Silicone Prosthetic pieces. FX Transfers apply with only water and stay on all night. Created by Hollywood FX artists to be the most realistic wound FX on the market. This gaping, blowout wound is perfect for addition that extra little bit of realism. Edges blend into your skin for an ultra realistic effect! Ripped Flesh Special FX Make-Up Wound. FX Transfers apply with only water and stay on all night. Created by Hollywood FX artists to be the most realistic wound FX on the market. Edges blend into your skin for an ultra realistic effect!